Another year goes by and the DT "monthly Newsletter" returns yet again? Yes and no - yes recounting the past but no in regard to the future. We've regrouped and will now focus on what we enjoy best - this website - updating all of our darts information and reporting darts news in this newsletter. We're no longer involved with any league administration - a time consuming task that goes mostly unappreciated at best. Cheers to those of you who do perform that task! DartsThailand.com is an independent darts publication. We are not affiliated with any darts league, club, association or organization in Thailand or any other country and therefore have no conflict of interest reporting all darts news. Gearing back up is taking some time and the news here is what we have found and contributors so far have sent us. Apologies to any who've we have missed. Email us and we will be most happy to include your darts information and or news. You can always add an event to the DT Calendar yourself - if you have any problems with doing that just give us a holler. numbered. In Washington Square's more recent heyday it contained eight dart bars. Entering from from Sukhumvit Rd. - Sportsman, Silver Dollar, Texas Lone Star, Wild Country, Cat's Meow, Bourbon St. and 52 Bar are now only found memories of WS. Nearby Larry's Dive on Soi 22 is also gone. Numbers remain the same but some bar name changes in nearby Queen's park Plaza - look for our new update. So much for the bad news and now onto the good. From the square - B52 moved to Queen's Park Plaza but unfortunately no longer has space for darts. Sportsman is slated to open a new operation on Soi 13 - including darts. Bourbon St. has been operational in their fine new location on Soi 63 Ekamai - still one of Bangkok's most popular eateries but sadly without darts. Owner Doug Harrison is a handy darts player although seeing him at the darts oche now days is about as common as a direct overhead solar eclipse. When in Bourbon St. - tell Doug he needs a darts board and you can quote his golf teacher Ned Hughes on that. iDartsThailand.com on Ekamai Soi 63 Sukhumvit Rd. Bangkok is definitely the most impressive darts venue I've ever see and I doubt if many or any could top that claim. Purpose built for darts - iDartsThailand has two floors with twelve Darts Live boards comfortably spread with every seat in the house able to see the main stage board - with super size projection above it. They also have a fully stocked bar - food menu - darts supplies and even a pool table for their less skilled patrons. You really do need to see this place to believe it - Andy Ho who runs the operation will be happy to show you around. If all this ain't enough to already spark your interest then check out their specials. The one that really caught my eye - their October Beer Buffet - all the draught beer you can drink for only 399 Baht. Whoa baby all the draught beer you can drink in a great darts bar - now it just don't get no better than that! "Dartoid" AKA Paul Seigel is a regular visitor and longtime friend of DT as well as the Thailand darts community. DT staff Jayke, Damian and me recently accompanied Paul to iDartsThailand on Ekamai Soi 63 Sukhumvit for an absolutely great night of darts in their venue which can only be described as a darts palace. Now consider this observation is from four steel-tip players. But Dartoid says it best in his recent column "It's time to wake up and smell the plastic!" click on his website link to read the entire article. It's spot-on and a great read for both soft & steel tip readers. Be sure and follow all Paul's darts adventures around the world from the following links and we'll be sure to let you know the next time he's headed back to Thailand. One more point about iDartsThailand that still has me chuckling - the lovely gals in these photos are not waitresses or only waitresses - their title is DI. Being retired army DI has (had) only one meaning to me - Drill Instructor in basic training. But no these DI gals are "Darts Instructors." Now if they had DIs like this when I joined the army - I'd of spent my entire career in boot camp! Pattaya is one happening darts town in Thailand and it's really great to see such a boom in the popularity of darts there. Recently visited a few bars there with Jayke and typical of DT reporting policy - we had no plan - out on Saturday night with total focus on TV football (soccer for our American readers). Even so - we met lots of great people - darts people and will soon return on their darts nights - just about every other night - for more photos and reports. 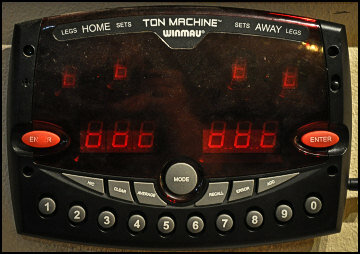 The scoring machine pictured left is standard in all Pattaya dart bars. Strange - never seen one in any dart bar in relatively nearby Bangkok. I prefer the traditional board & marker - not because of my strong skill in maths but my personal hatred of learning new devices. The Irish Rovers is a "must see" darts venue in Pattaya - run by affable publican Simon - pictured above. By no means a small place but what you notice right off the get-go is how efficiently they have utilized their floor space. Three competition darts lanes with a forth used as a warm up board. Irish Rovers runs regular darts events that attracts players not only from Pattaya but many Bangkok players as well. A well stocked bar is across from their pool table with every seat in the house having easy view to their many TVs and one large screen. They also have a great menu and rooms for rent. Last but certainly not least is Irish Rovers' bevy of babes and we will take up Simon's kind offer to return for a photo session. Expect to be seeing some of the lovely gals from Irish Rovers as Darter of the Month in upcoming newsletter issues. Ah - so you have to wait till the lazy bums from DT photo department return before you can see some photos? Not at all - you can check out their photo galleries on both their FaceBook & Website by clicking the following buttons. The Mee Chew Bar is a long established Pattaya Darts bar run by a darts legend - Mel. The photos and newspaper clippings of him and other greats leave you with absolutely no doubt that you're talking to one knowledgeable darts player. We only missed it by a few weeks as one of Mel's darts pals was recently at Mee Chew visiting - Gary Anderson - won't miss another opportunity like that again in the future. Mee Chew has a great laid back atmosphere were some serious darts happen. Will definitely be back here with some future reports. The Londoner Bar in Pattaya is run by our good friend Angus - the least distinguished looking gentleman upper right - in the above photo. Angus was a great supporter of darts even as a non-player here in Bangkok where he previously owned a pub. Guess the Pattaya Darts Enthusiasm Bug bit him as he is now an active player in Londoner Bar and their winning team. But his claim on their FaceBook - of hitting his first 180 has yet to be confirmed by any player or even any of his own staff. As the Saturday football games finished - we enjoyed a few games of darts. Angus holds court with the regulars every night and Londoner Bar is definitely a friendly darts pub worth visiting. Located in Chonburi - about midway between Bangkok and Pattaya - Chonburi Darts Club is run by the affable Aek - seen in the grey shirt. Only a few months old - they hit the ground running becoming a popular darts venue and have already hosted the first Chonburi Darts Open - many photos on their FaceBook. CDC has four steel-tip boards and one soft-tip and also a pool table and a snooker table. They have a food menu and their Thai food is excellent. 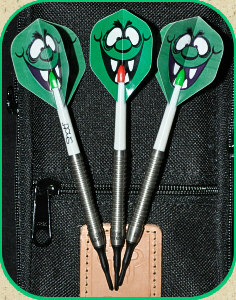 They have a great selection of darts and darts supplies and carry both Puma and Winmau dart boards. We really enjoyed our visit on Sunday and long time friends Sam & Noi just happened to pop in while we were there. Look forward to our next visit and am sure you'll see a lot more of CDC in upcoming darts news. Special thanks to the lovely Miss Tan (lower right) for allowing Jayke (lower left) to win a few games otherwise all of us would've had to listen to him whine the rest of the way back to Bangkok. Actions speak louder than words and boy ain't that the truth with Pattaya City Darts Organisation (PCDO). In their relatively short existence they've accomplished more than many well established darts organisations. Many thanks to Charlie - administrator of PCDO for sending us this information. Job well done Charlie - now someone needs to buy that guy a beer or two or three! And speaking of that - we here at DT look forward to some darts and a "few" beers when down your way next. Scully's Korong Vale Hotel in Korong Vale, Victoria is our featured venue in DT's new International Darts Highway report. Thailand's darts communities are unique to most in that so many of our players come from all parts of the world. This feature allows us to introduce darts venues of our players from "back home." Scully's Korong Vale Hotel is a long established business founded in 1891 that was recently taken over by our good friends Gary & Amon Sinnott - photo below. More about Scully's from their FaceBook: Good Family fun. Darts, pool and good music. Excellent authentic Thai food and a great range of Aussie food favourites. Dart players well catered for - 2 permanent boards and strong competition - 3 teams playing League Tuesday nights, Open board Friday nights. Visiting dart and/or pool teams welcomed! We can provide good strong opposition and we have 12 rooms available for accommodation for just $30.00 per night single, $40.00 double, inc. Breakfast. 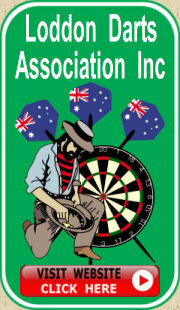 Only 240 Km from Melbourne, we will provide you with a great weekend of darts, food, booze and friendship. List your darts event here - free. We'll be happy to list your event in this section of DT's Newsletter- all you need do is contact us with the information. Additionally you can also post your event on our calendar as well as contact us to add darts bar to our list. Do you have a regular weekly darts event? If so, send us the information and we'll list it in each newsletter - example New Cowboy's weekly "Why Darts?" as seen to the right. Looking to attract more players in your league? If you're willing to write a brief overview - we'll give you a spot in each newsletter with links to your website - a few photos make an even better article. Welcome to all new readers and to all of you that followed us before let me say - on behalf of the entire DT staff that it sure is good to be back and back we are to stay. Keiran, Jayke and me are happy to introduce our new full time staff member - professional TV cameraman Damian. And for those who contributed in the past we invite you to join us again. Again we'll be doing our best to get everything updated and getting out a more regular newsletter than once a year. Apologies to PEA Darts Open for getting this issue out so late in the month - days if not hours before your fine event begins.